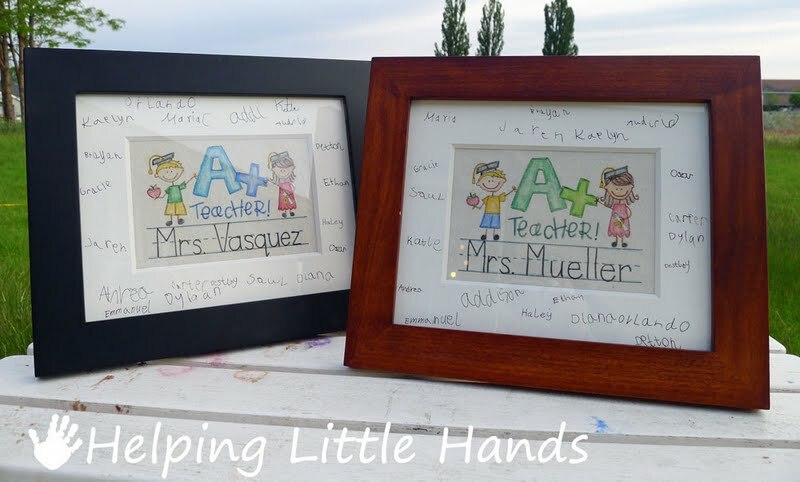 I've been trying to think of an end of year gift that Firecracker's Teacher would be able to enjoy for a long time without taking up too much room. 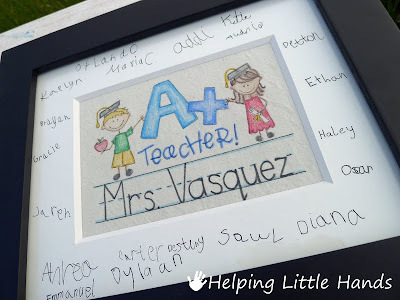 I also wanted it to be something that could be from the whole class because I know that a lot of kids in her class don't have the money to buy teacher gifts and at 6 years-old don't always realize they could make one on their own. I used the A+ Teacher Pattern from Twin Stitchers, but instead of embroidery, I used a fabric pen and crayons to make a "faux embroidery." My full tutorial for Faux Embroidery can be found here. It's really easy (and addictive!). This one took me about 30 minutes. Basically you trace your stitchery design onto muslin and color it in with crayons, but I've got more specific tips in my tutorial. 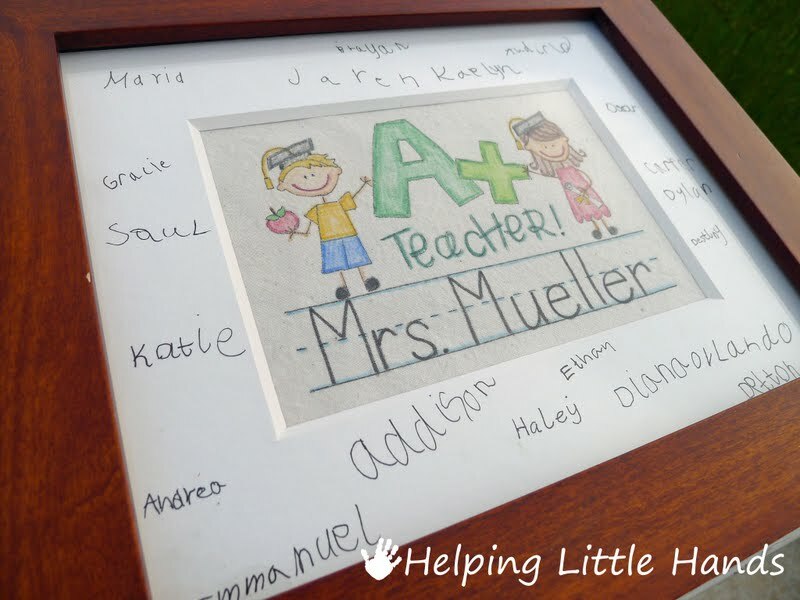 I think what really makes this a great gift is all the little kindergarten signatures around the mat. I arranged with the computer teacher to go in during the class computer time, so Firecracker's teacher wouldn't know. I had the kids come over one at a time and practice writing their name on a cardstock mat I'd traced for practice, and then I had them write their name on the real thing. I was lucky enough to find the frames with mats at Goodwill for $2 each. They are 8x10 frames with the mats making them 5x7. I also used a scrapbooking pigment pen that I got when I was experimenting with faux embroidery, but I would think an ultra-fine tip sharpie would work well too. And don't underestimate the ability of a kindergartener to misspell their name...even after the practice run. A couple of them lost track and either left a letter out or wrote one twice. Oh, well. It all comes with the charm of kindergarten. I also made one for the full-time aide that works in Firecracker's classroom. The kids love her and we're so lucky that the class gets the extra help. And if you know one of these fine ladies...SHHHHhhhhh! Don't tell. We're not given them to them until next week...but I'm pretty sure neither of them read my blog. I'm sure they loved them! I do! LOVE IT! Love the idea of having the kids sign the mat! Good thinking!!! One question: are they dated somewhere? I agree - the signatures are the BEST. Well, so are the darling faux-embroidery pictures. Way cute. And practical for teachers - they can go on a wall and not take up shelf space. So sweet. Just want to let you know I am sharing this on my blog...I hope you don't mind. Have a great weekend! So cute! The more I see of your faux embroidery the more I LOVE it! As a teacher, I can tell you that I would absolutely cherish that gift for years to come! 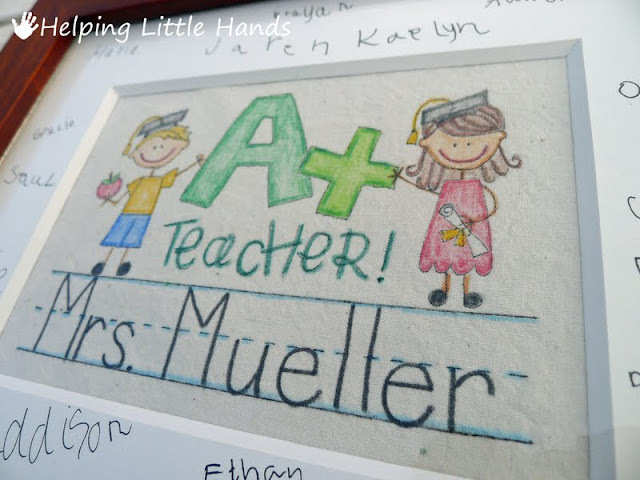 I'm sure they loved it - what a great mom you are for showering your child's teacher with love! I really like this idea, thanks for sharing. I am your newest follower. What a thoughtful and precious gift! Would love for you to share them at the Pretty Packages Party! I have two helping little hands myself.